The thought of lions and tigers and bears may have frightened Dorothy and her friends when they entered the forest, but luckily, you probably don’t have to worry about encountering any lions or tigers when you explore the outdoors. Bears, on the other hand, are a different story. With a wide range and increasing population throughout North America, bears do pose a threat when you embark on your outings. While it is essential to practice bear safety, it is also important to maintain perspective. Your chances of experiencing a bear attack are less than the likelihood of being struck by lightning. Bears are afraid of humans and avoid us as much as we avoid them. In fact, most people never even know they were near a bear since the animal is so good at avoiding contact. Still, most people would rather not take their chances. With that in mind, we bring you our ultimate guide to bear safety. Before we tell you what to do should you encounter a bear, we should first tell you how to avoid that scenario in the first place! There are plenty of safety precautions you can take to make sure you’re not unknowingly luring bears to your location. The easiest and simplest thing you can do is store food properly. Leaving food out and about is akin to sending bears a written invitation to your campsite. Some campgrounds provide metal food lockers or properly equipped cabins where you can keep your food. It’s also a good idea to bring along bear-resistant food containers in case your campground does not have the aforementioned options. Hang your food from a high branch (at least 10 feet off the ground) that cannot support a bear’s weight. It may be easy to store food properly when you’re not using it, but what about when you need to eat? As tempting as it may be to enjoy a leisurely camp breakfast in bed, remember that you should never eat or have food in your tent. Should a bear decide to stop by and look for a snack, you don’t want him to tear your tent apart foraging for food. If you plan to cook, be sure to make your meals at least 100 yards from your tent. It’s also helpful to avoid foods with strong aromas, such as bacon ( ). Any foods that make your mouth water will likely have the same effect on bears. After you finish cooking, change your clothes and keep the old ones away from your sleeping area. Never leave food unattended. As soon as you are done eating, dispose of your scraps, leftovers and other food-related objects in bear-proof trash cans. Thoroughly wash all of your cooking and eating utensils at least 100 years away from your campsite. Don’t fly solo through bear habitat. Travel with a group and be as noisy as possible. By making your presence known, you will be more likely to scare bears off and not catch one by surprise. We probably don’t need to tell you this, but don’t go near carcasses or other food sources that are likely to attract bears. Leave your dog at home. As much as we enjoy spending time with our four-legged friends, dogs can unfortunately provoke a bear. If that’s not an option, use a short leash. Be alert and pay attention to signs that bears may be in the area. These include droppings, scratches on trees, torn logs, and tracks. The closer you are to a bear when it becomes aware of you, the more likely it will be to react defensively, so be on the lookout! Hike only during the day. 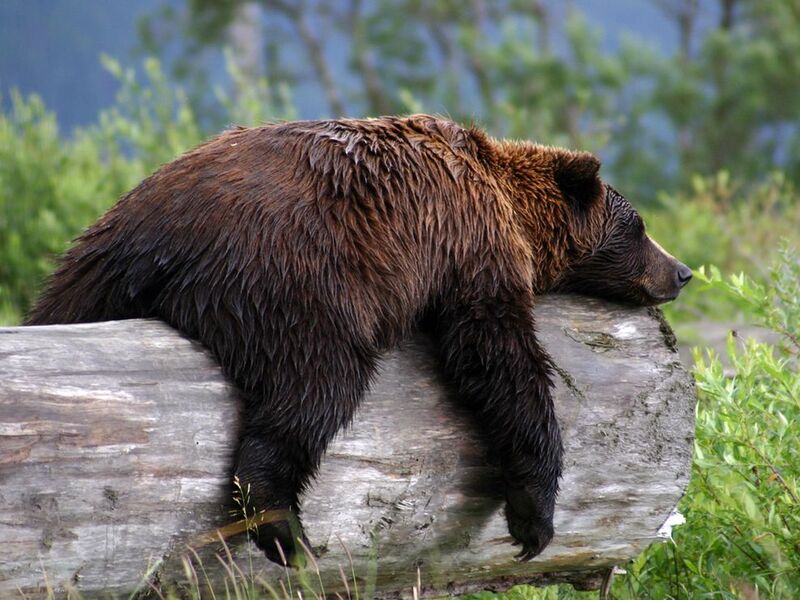 Bears are most active at dawn, dusk and during the night. Carry bear pepper spray, just in case! All of the bear safety precautions in the world can’t guarantee that you won’t run into a bear on your outings. Although this scenario is understandably frightening, keep in mind that most run-ins with a bear do not lead to aggressive behavior, and full-blown attacks are extremely rare. Nevertheless, here’s what to do if you come across a bear. If a bear enters your camping area, remain calm. Don’t feed the bear! A bear that has not scored a snack will leave more easily. Ensure that the bear has an escape route. Then try to scare it away by shouting, banging things, throwing things, and waving your warms. If the bear refuses to leave, back away slowly and move to a safe building or automobile, if possible. Do not approach the bear! This might fall under the category of “duh” but it is perhaps the most important tip! Don’t interpret the bear standing up as a sign of attack. He’s merely trying to catch a glimpse, sound, whiff, etc. to see what you’re all about. Avoid direct eye contact, which bears can interpret as a threat or challenge. Don’t run! A bear might think you are prey and chase you. Don’t high-tail it up a tree either. Bears are excellent climbers. Back away as you talk in a soft, low-pitched voice. If you take the above steps, chances are that you will not be experiencing a bear attack. Even though the following scenario is highly unlikely, it is still important to know what to do if this rare situation does present itself. First, know what is not an attack. A mother bear with cubs, a surprised bear, or a bear defending its food may react defensively in an attempt to get you to leave. It may swat the ground while snorting, pop its jaw, or lunge at you in a “bluff charge” to scare you away. If this happens, take the steps listed above, and grab your bear pepper spray – just in case! The main sign that an attack is forthcoming is if the bear follows you. If he continues to stalk you, then the bear likely considers you prey. It’s time to change your course of action. Stop backing away. Stand your ground. If possible, grab sticks, branches, rocks, etc. to wave while you try to look as big and imposing as possible. Shout loudly and stomp your feet to appear threatening in an effort to scare the bear away. Should the bear seem intent on approaching you, use your bear pepper spray! Aim for just above the head and spray when the bear is 20-30 feet away. This should deter the bear and get it to leave. If the bear makes physical contact, your response should depend on what type of attack it is. If it is a predatory attack after being trailed by the bear, fight for your life. Punch, hit, kick, beat, and harm the bear with either the weapons you grabbed above, or any improvised weapon you can find. On the other hand, if you are being attacked by a defensive mother grizzly who is defending her cubs, fall to the ground and play dead. Lie on your stomach and cover your neck with your hands. Stay still and don’t scream. Defensive bears will most likely stop attacking once they feel you are not a threat. Although the idea of having a run in with a bear is scary, remember that the chances of experiencing a bear attack are very slim. When you take the proper bear safety precautions and know how to react should you come across a bear, the chances are even slimmer.